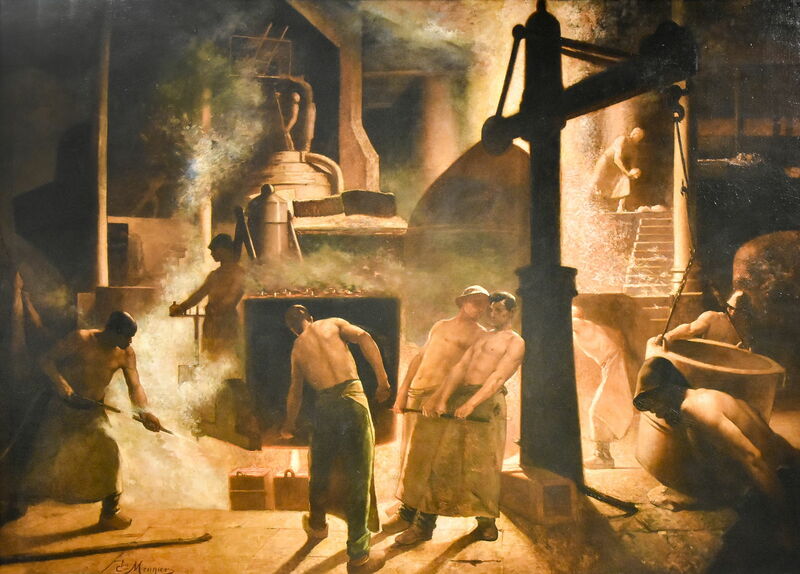 Constantin Meunier (1831–1905), The Foundry at Seraing (date not known), media and dimensions not knonw, La Boverie, Liège, Belgium. Image by Paul Hermans, via Wikimedia Commons. 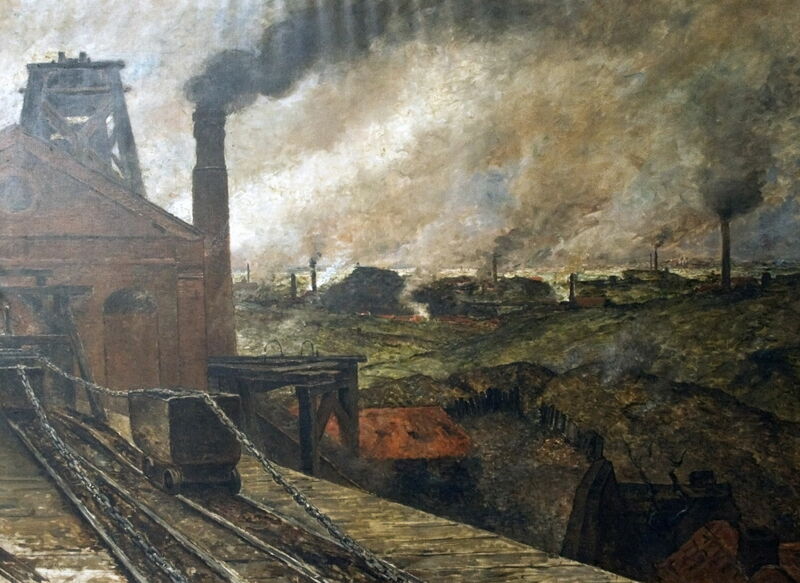 Today, Constantin Meunier (1831–1905) is best known for his gritty paintings of coal mining and foundries in Belgium in the late nineteenth century, and his sculpture. He started to paint these motifs in 1880, when he was commissioned to paint industrial parts of the country. He continued to paint and sculpt miners, foundry workers, and others employed to perform strenuous and unpleasant work until his death, as far as I can see. Unfortunately almost all of these paintings are undated. 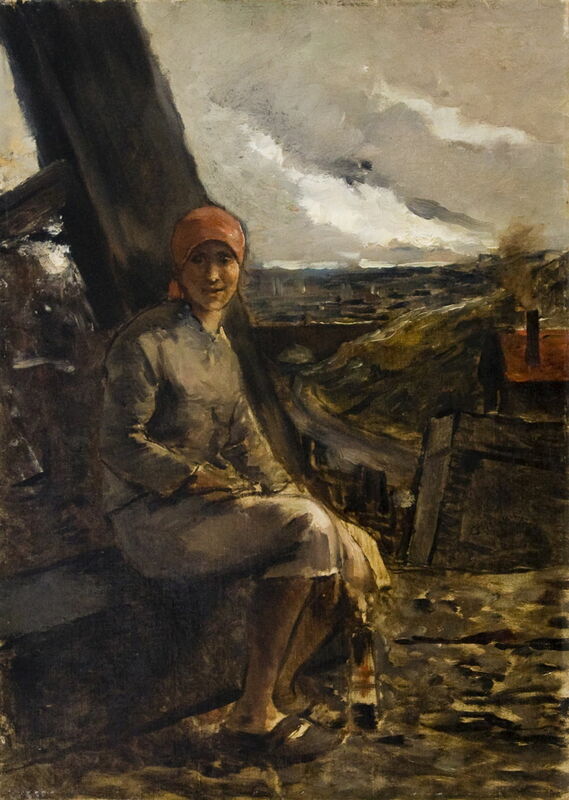 Constantin Meunier (1831–1905), Mining Area (date not known), oil on canvas, 61.3 x 100.2 cm, M-Museum Leuven, Leuven, Belgium. Wikimedia Commons. 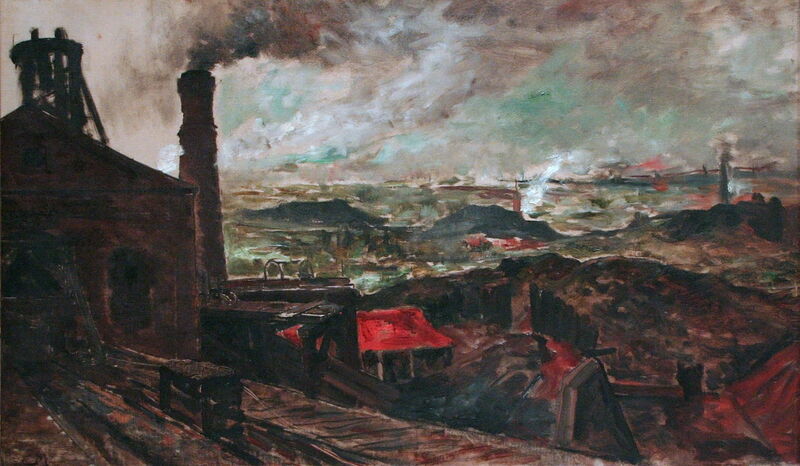 The similarities between Meunier’s Mining Area (above) and Black Country – Borinage (below) suggest that they are the same view, and that above may have been his original plein air sketch. The Borinage was one of the major coal mining areas in Europe at the time, and is in the Belgian province of Hainault. It was here that Vincent van Gogh lived between 1878-80. From the 1880s, it was the scene of a succession of strikes, in which many of the protesters were injured or killed by police and military. After the Second World War, the coal mines went into decline, with the last of them closing in the 1960s. The tower at the left is the pit head, where trucks of freshly-cut coal were brought to the surface. 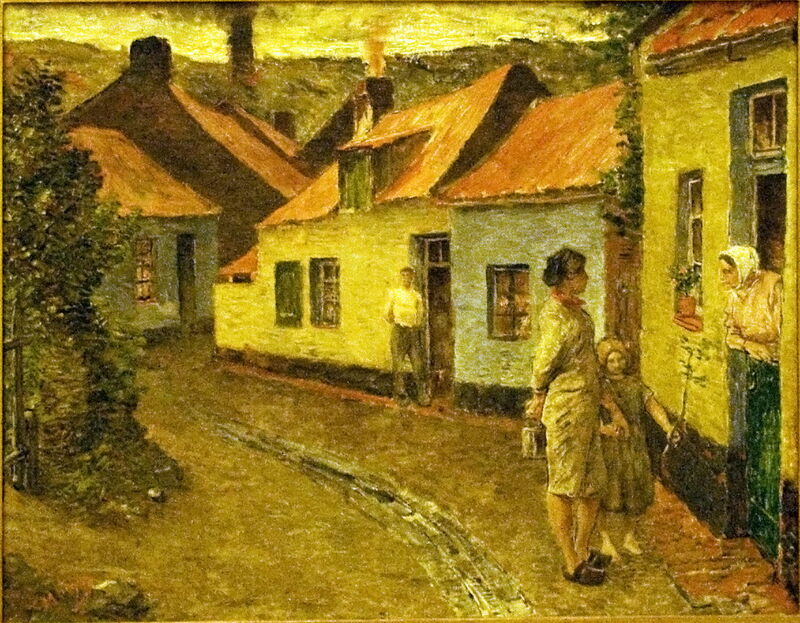 Constantin Meunier (1831–1905), Black Country – Borinage (date not known), oil on canvas, dimensions not known, Meunier Museum, Brussels, Belgium. Image by Szilas, via Wikimedia Commons. Constantin Meunier (1831–1905), The Roofs of the Coron (date not known), oil on canvas, dimensions not known, Meunier Museum, Brussels, Belgium. Image by Szilas, via Wikimedia Commons. 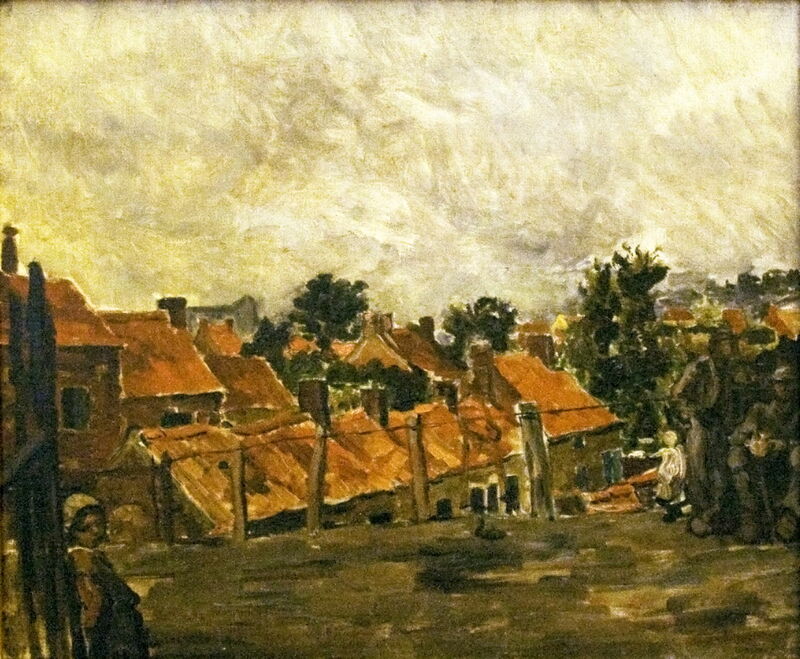 The Roofs of the Coron shows the numerous miners’ cottages of this village near the French border, in the Borinage. Constantin Meunier (1831–1905), Coron, Women having a Chat (date not known), oil on canvas, dimensions not known, Meunier Museum, Brussels, Belgium. Image by Szilas, via Wikimedia Commons. Coron, Women having a Chat gives insight into the close communities in these areas, and shows the main drain running down the middle of the street. 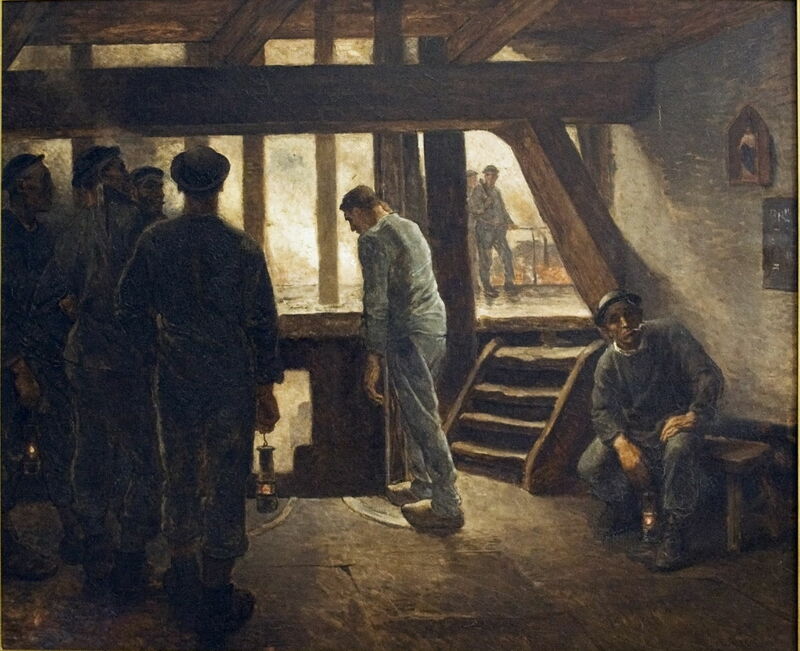 Constantin Meunier (1831–1905), Miner at the Exit of the Shaft (date not known), oil on canvas, dimensions not known, Meunier Museum, Brussels, Belgium. Image by Szilas, via Wikimedia Commons. Meunier’s painting of Miner at the Exit of the Shaft shows several miners enjoying a few moments to smoke and relax at the pit head. Three are carrying safety lamps, which were used to minimise the risk of underground explosions even though they had flames inside them. These were developed in about 1815, after a long succession of mine disasters caused by explosions, and weren’t replaced with electric lamps until after 1900. Constantin Meunier (1831–1905), Return from the Mine (date not known), oil on canvas, 159 x 115 cm, M-Museum Leuven, Leuven, Belgium. Image by Ophelia2, via Wikimedia Commons. 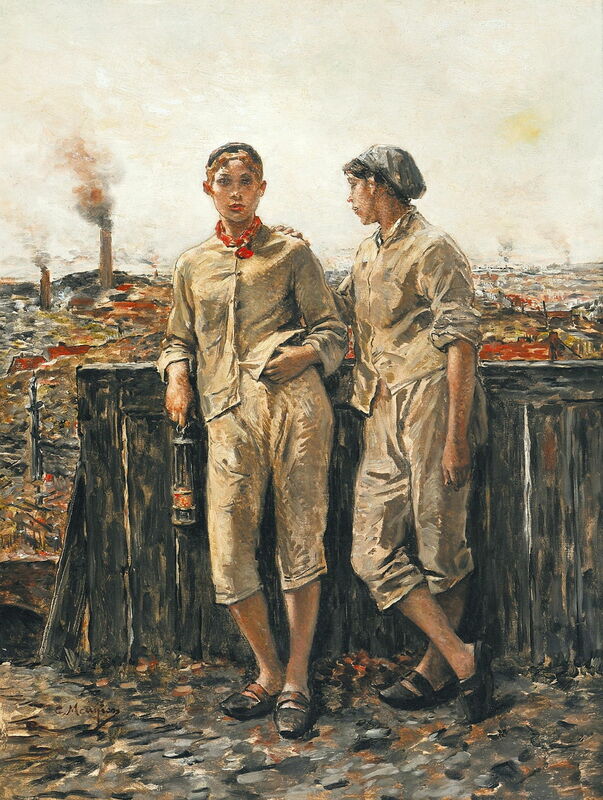 In his Return from the Mine, two male miners stride back to their cottages after completing their shift underground. With them is a young woman, employed to perform supporting tasks, who is walking barefoot and holding up her wooden clogs. Constantin Meunier (1831–1905), The Carriage Driver (1887), media and dimensions not known, Museum Dhondt-Dhaenens, Sint-Martens-Latem, Belgium. Wikimedia Commons. Painted in 1887, The Carriage Driver shows another working woman, taking a short break from her duties. She appears to be sat by the pit head, and has a safety lamp by her left leg, making it likely that she too is in one of the mining areas. Constantin Meunier (1831–1905), Les Hiercheuses (c 1885-90), oil on canvas, 66.5 x 50.5 cm, Private collection. Wikimedia Commons. One task which was largely performed by women was the movement of wagons containing coal or spoil (general rock debris). These two young women, termed Les Hiercheuses, did just that, and were painted by Meunier in about 1885-90. Constantin Meunier (1831–1905), Triptych of the Mine (Descent, Calvary, Ascent) (date not known), oil on canvas, dimensions not known, Meunier Museum, Brussels, Belgium. Image by Szilas, via Wikimedia Commons. Meunier also made monumental reliefs and sculptures to commemorate the miners, as well as this Triptych of the Mine, which shows their Descent, Calvary, and Ascent, to parallel the Crucifixion. 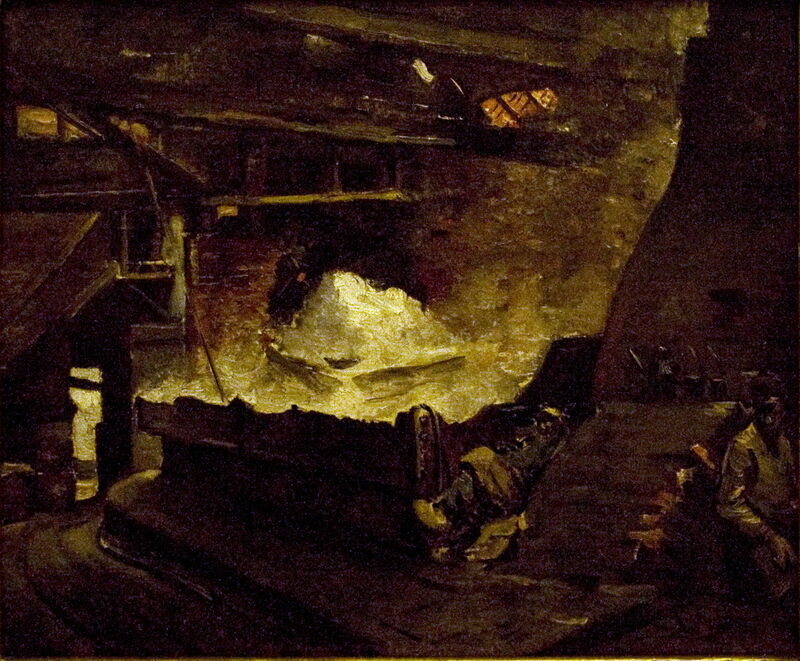 Constantin Meunier (1831–1905), Steel Foundry (date not known), media and dimensions not known, Koninklijk Museum voor Schone Kunsten, Antwerp, Belgium. Image by Ophelia2, via Wikimedia Commons. Production of steel on an industrial scale started after 1857, with the introduction of the Bessemer Process. 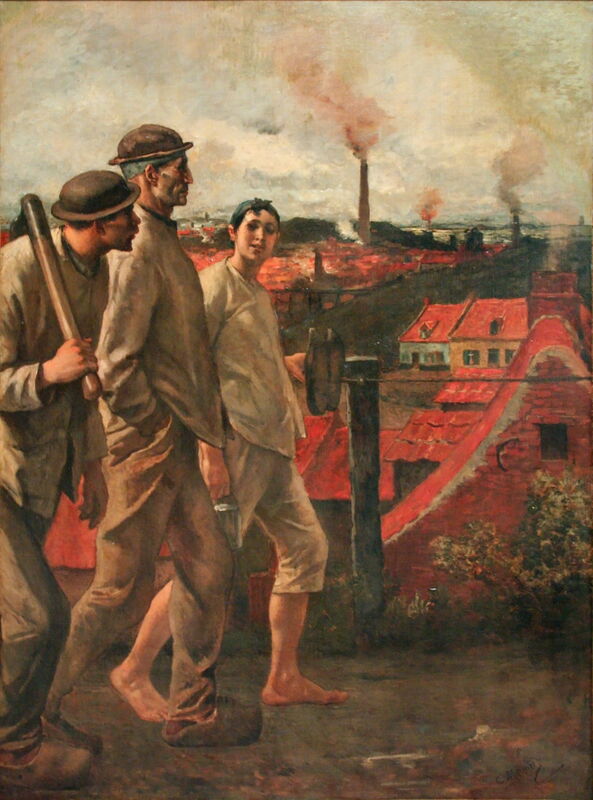 Meunier painted the viciously hot interior of a Steel Foundry, its workers unprotected from the hazards around them. 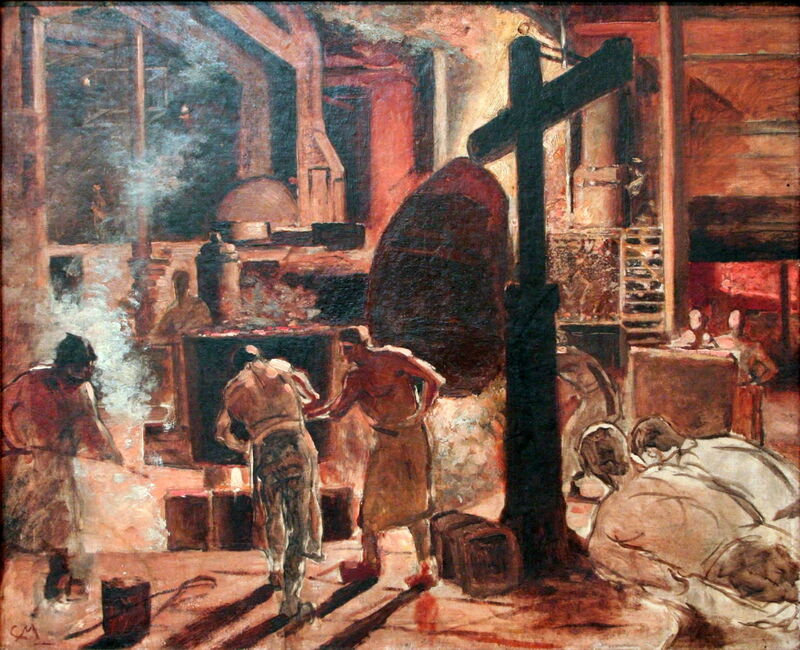 Constantin Meunier (1831–1905), Foundry (1902), media not known, 80 x 67 cm, Kansallisgalleria, Ateneum, Helsinki, Finland. Wikimedia Commons. 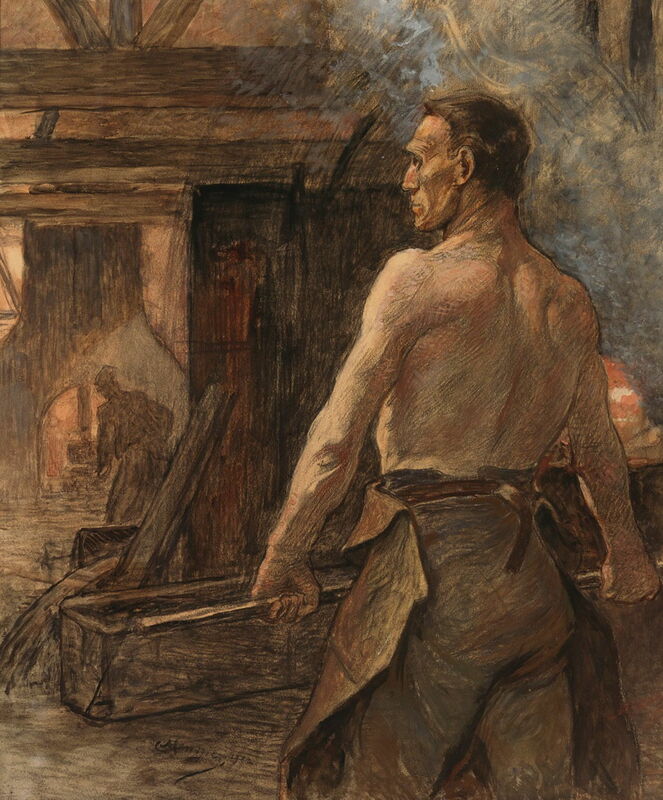 One of his later paintings, Foundry from 1902, shows a worker stripped to the waist to cope with heat, wearing a ‘protective’ leather apron. Meunier’s The Foundry at Seraing shows the interior of one of the many steel factories near the city of Liège in Belgium. The first ironworks had been established there in 1809, and throughout the rest of that and the twentieth century, the area produced and worked both iron and steel. Constantin Meunier (1831–1905), In a Salt Refinery at Rupelmonde (date not known), oil on canvas, dimensions not known, Meunier Museum, Brussels, Belgium. Image by Szilas, via Wikimedia Commons. Meunier painted other similar industries, here In a Salt Refinery at Rupelmonde, a town on the River Schelde in Belgium. This industrial process involves heating brine to generate a great deal of steam – another very hot and demanding workplace. Constantin Meunier (1831–1905), Women Working in a Glass Factory (date not known), oil on canvas, dimensions not known, Musée Meunier, Ixelles, Belgium. Image by Szilas, via Wikimedia Commons. Finally, his Women Working in a Glass Factory shows an example of factory work employing many women. 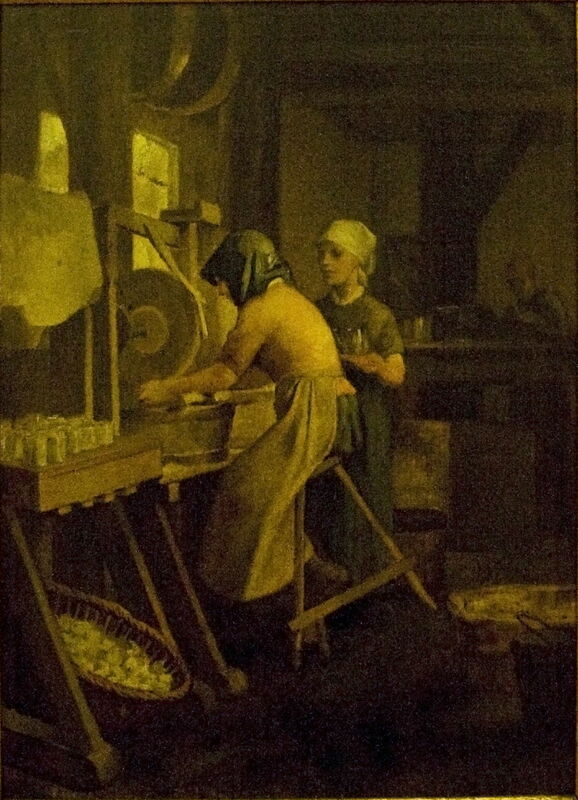 Seraing still has a large glass factory, and this work may have been painted when Meunier visited the town’s foundries. Among Meunier’s many major sculptures is the Émile Zola monument in Avenue Émile Zola, Paris, completed with Alexandre Charpentier. Meunier died in Brussels in 1905. Posted in General, Life, Painting and tagged Meunier, painting, work, workers, Zola. Bookmark the permalink. Thank you: these are incredible! I am surprised to not have seen them before. They make such an important statement about workers. I think that most of his and similar art is now held by local museums, and relatively little is on display in the larger galleries. Society’s attitudes don’t really change much: art is supposedly about pretty things, not major social issues, even now. Very surprising to see 19th-century women in trousers, and short ones at that. You taught me something I didn’t know! I understand that they were mandatory for those women working in certain industries, such as the mines.